Yep. There it is. 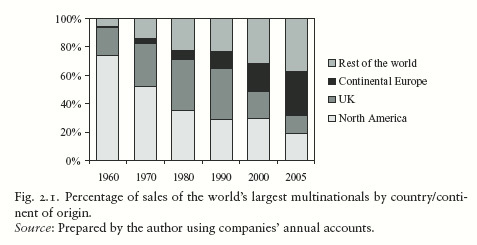 North American multinationals selling less and less beer, with Europe and the rest of the world stealing the share. This comes from Teresa da Silva Lopes’ Global Brands, a handy piece of business history on alcohol branding. With the InBev purchase, how far further will that North America bar shrink?